Charles Thomas Cross was one of the many soldiers of the Durham Light Infantry (DLI) who was killed during the Battle of Arras. He was born in Durham City on 26 September 1885 and lived first with his parents at 50 Queen Street, then with his wife at 18, Allergate. Charles’ father, William Cross was born in 1862 in Abingdon, Berkshire. He worked as a waiter, then as a college steward/caretaker. Charles’s mother, Margaret Ann Cross, nee Ridley (b. 1859), was a domestic servant. The couple had three other children, all younger than Charles: Joseph Ridley Cross (b. 1889); Beatrice Ethel Cross (b. 1891) and William Cross (b. 1894). On 14th May 1900, Charles started work as an apprentice at Harrison and Harrison, Organ Builders, in Durham. He remained there until 1914, becoming a full employee and possibly working on the organ at Durham Cathedral, which was built in 1905 and is still in use today. In 1910, he married his sweetheart Sarah Jane (b. 1888) in Willington and the newlyweds moved to Allergate. On the outbreak of war, Charles joined the 18th Battalion Durham Light Infantry – he had already served 6 years with the Royal Garrison Artillery Reserves (with 1 year Royal Field Artillery). After attesting, Charles began his training at Cocken Hall with the 18th Battalion Durham Light Infantry, know as the Durham Pals. On 22 December 1914 he disembarked in Egypt and then was shipped to France, landing on 11 March 1916. He was promoted to sergeant on 28 August 1916, during the Battle of the Somme. A little less than a month later, he was admitted to 11th Casualty Clearing Station with influenza. He was killed at Arras on 3 May 1917. 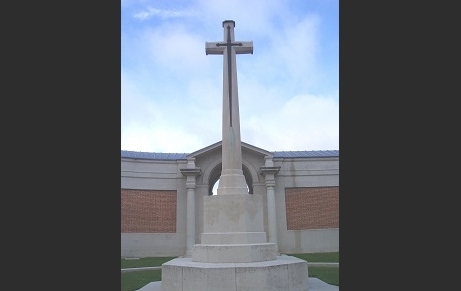 He was awarded the British war Medal; the Victory Medal and the 1914-15 Star and is remembered at the Arras Memorial. In November 1917, Charles’s widow was granted a pension for herself and her daughter of 21s 3d per week. The list of his effects includes photographs, letters, wrist watch, gold ring, string of beads and locket. Perhaps these last two were intended as presents for his wife and young daughter. By the time Sarah Jane completed the statement of relatives of the deceased in 1919, which survives in Charles’s Army Service Record, she had remarried; she signs herself Sarah Jane Friend on this document.